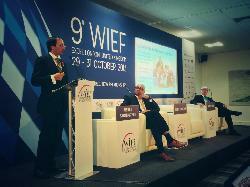 The 9th World Islamic Economic Forum (WIEF) was held at Excel London on 29 – 31 October 2013 under the theme “Changing World, New Relationships”. The forum aimed to encapsulate the emergence of new economic linkages between nations across borders, religions and cultures in a fast changing world. During the Forum, Mosaic was delighted to jointly deliver a masterclass session addressing Youth Unemployment and Apprenticeships with the Ashoka Foundation and Youth Business International (YBI). The session showcased the role of the Prince’s Charities, of which Mosaic is a part, in tackling youth unemployment and apprenticeships. A key component of the masterclass was discussion around the role of entrepreneurship in reducing youth unemployment; a particularly timely discussion as we prepare for the launch of 2013/2014 Apax-Mosaic Enterprise Challenge during Global Entrepreneurship Week, which will take place during 18-24 November 2013. Photo from left to right: Shabir Randeree [Mosaic National Advisory Board Member], Vishnu Swaminathan [India Country Director, Ashoka Foundation] and Andrew Ward [Development Director, YBI]. The masterclass session was designed as an in-depth analysis to address the issues surrounding youth unemployment, set within the context of the recent global financial crises and the repercussions of the Arab Spring, both which have contributed to devastating consequences for jobs around the world, particularly affecting young people. The session highlighted the gravity of the situation for young people, presented hard facts and relevant statistics to demonstrate that without careful intervention, we look at facing catastrophic problems in the near future.